After launching several cards for the consumer market, AMD is back in the professional market with an update in the form of the FirePro S9170 Accelerator. Regarded as the successor to the FirePro S9150, the S9170 comes with the Grenada core architecture that features an insane 32 GB of GDDR5 memory and massive amounts of compute aimed at DGEMM (Dense General Matrix) and server minded workloads along with full OpenCL 2.0 support. 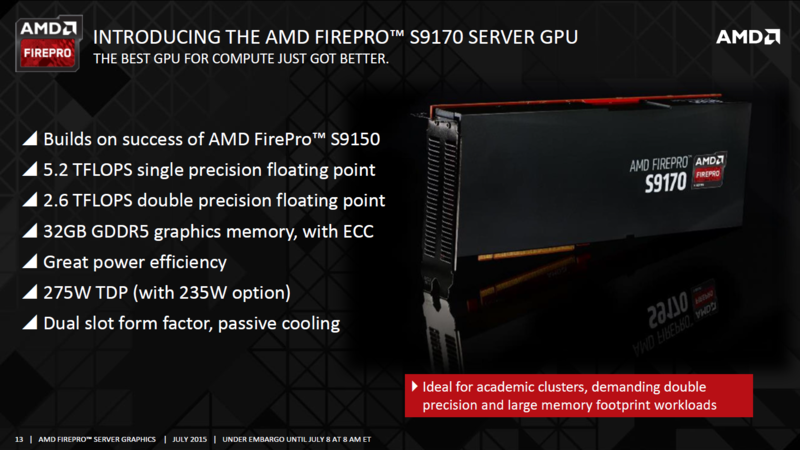 The AMD FirePro S9170 is an update to the FirePro S9150, aiming at server and HPC markets. Both cards are based on the Hawaii XT GPU core with 44 Compute Engines that pack 2816 stream processors, 176 TMUs and 64 ROPs. The difference lies within the power optimizations and efficiency improvements which were recently added to the Radeon R9 390X and Radeon R9 390, in specific the Grenada GPU core which is a revised version of Hawaii. Compared to the 900 MHz clock speed on the S9150, the S9170 comes with a clock speed of 930 MHz that pushes the FP64 (Double Precision) performance to 2.62 TFlops compared to 2.53 TFlops on the S9150 while the FP32 (Single Precision) performance is leveraged to 5.24 TFlops compared 5.07 TFlops on the S9150. The major difference between the S9170 is that it has a max board power of 275W compared to 235W of the S9150. There is an optional 235W version available for other suitable workloads. The card is fed power through a 8+6 Pin power configuration that is found on the back of the PCB. Moving onwards, the S9170 gets a big update on the memory front. AMD has configured this top tier HPC card with 32 GB of GDDR5 memory which is the most found on any graphics card. The second card to feature a high memory is the Tesla K80 with 24 GB GDDR5 VRAM but even that doesn’t match what AMD has on board their HPC accelerator. HPC cards do actually require large pools of VRAM for professional usage to render intense tasks, simulations and models. “What makes AMD’s GPUs particularly well suited for HPC boils down to four things: very high compute performance; leadership in performance-per-watt; the largest available working memory size; and our embracing of open standards, including the most recent revision of OpenCL,” said Niles Burbank, senior product manager for professional graphics at AMD. While AMD and NVIDIA have fast HPC options, it should be noted that neither company has yet launched a HPC focused accelerator based on their latest, top-tier cores. NVIDIA made clear that due to lack of FP64 blocks on the Maxwell cards, they won’t offer products in the Tesla market and Kepler will be offered in 2015 as the only Tesla options until 2016 when NVIDIA introduces their Pascal GPU architecture with second generation HBM memory. 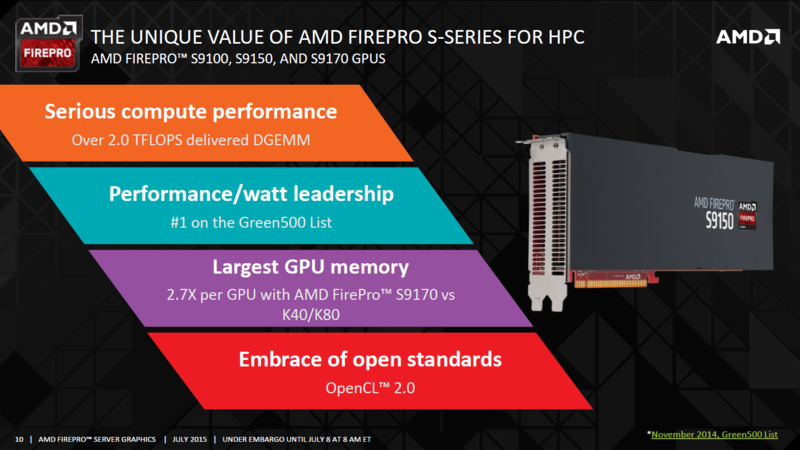 AMD is also taking a similar approach as their Fiji GPU may not be making way to the FirePro S-Series market since its a gaming focused chip and a refocus on the server market is expected in 2016 with FinFET GPU offerings. 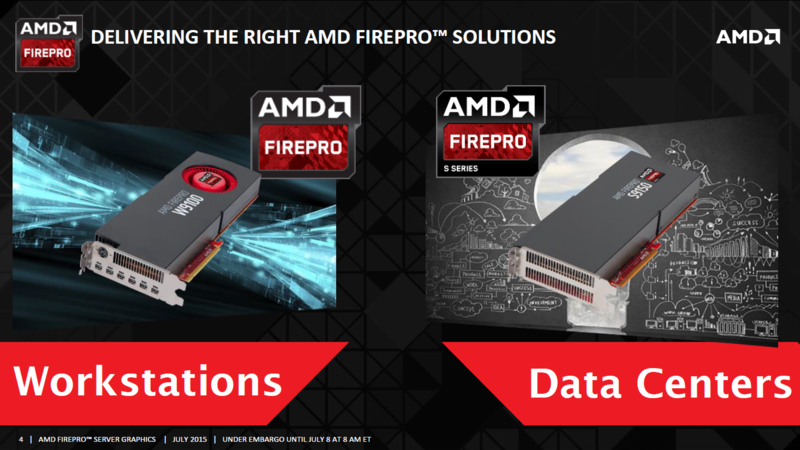 The post AMD Launches FirePro S9170 Accelerator – 32 GB GDDR5 Memory and Grenada’s 5.24 TFlop Compute Power by Hassan Mujtaba appeared first on WCCFtech.